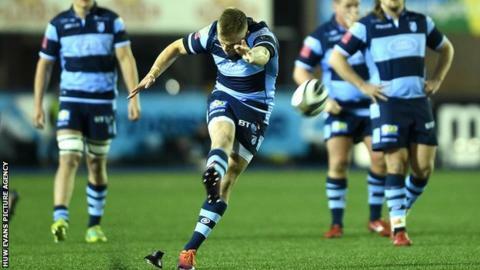 Gareth Anscombe wants to stay in Wales and at Cardiff Blues "deep down in his heart", says head coach John Mulvihill. The 27-year-old suggested after Wales' Six Nations Grand Slam that a number of players, including himself, had considered moves away from Wales. Moves abroad would see players with less than 60 caps, including Anscombe, lose their place in the Wales team. "He [Anscombe] could go and get a lot more money playing overseas but he does not want to do that," said Mulvihill. "He wants to play for Wales, go to the World Cup and I think deep down in his heart he wants to be at the Cardiff Blues." In 2017 the Welsh Rugby Union changed its senior international selection policy (SPSP) so any player taking up a new contract not with a Welsh region must have won 60 caps to be eligible to play for Wales. However changes to domestic rugby in Wales from the 2020-21 season, dubbed Project Reset, has caused a lot of uncertainty among the four regions and their players. The changes will see an end to dual contracts - funded jointly by the WRU and the regions - and introduce pay banding for players. Delays have led to problems for players in contract negotiations, with Anscombe among those players who current contract expires at the end of the season. "We're getting closer, there are a few contractual issues we are trying to work through to make a final offer to Gareth that I think shows his worth to the game in Wales," added Mulvihill. "We are working through it and hopefully we can get something done in the next few weeks."